Provision of water supplies of adequate quantity and quality is one of the key functions of forested catchments. Logging and clearing affects water quantity, water quality and fire regimes. With climate change predictions of increasing temperatures, more frequent droughts and decreased rainfall in south-eastern Australia, ensuring forested catchments are protected should be a priority for governments. FORESTS HELP KEEP ECOSYSTEMS HEALTHY IN THE FACE OF CHANGING CLIMATE AND PROTECT ANIMAL POPULATIONS. The reservation of as many habitats as possible is identified as being of primary importance in conserving maximum biodiversity in the face of climate change (Dunlop and Brown 2008) and conserving maximum biodiversity is in turn a prudent measure to ensure that the risk to ecosystem service provision from climate change is minimised (Cork et al. 2007). Science has shown that large old trees continue to store carbon throughout their lives and that Australia’s extraordinary forests store more carbon than was previously thought. The restoration of Australia’s forests will also have an important part to play in incremental carbon accumulation, saving threatened species, the health of waterways and catchments, and the prevention of erosion and loss of soil carbon. While planting trees on already cleared land is a valuable way of drawing down carbon from the atmosphere, the primary mitigation value of forests lies not in their present uptake of CO2 but in the longevity of their accumulated carbon stocks. Protecting native forests is the quickest and easiest way to make deep reductions in carbon emissions, and should be an important part of the government's platform on climate.” Growing trees is a long term proposition to achieve carbon sequestration, whereas decisions not to log result in an immediate and substantial emissions reduction. When forests are logged, large amounts of carbon dioxide is released into the atmosphere. After logging forests are often burnt, releasing more carbon into the atmosphere. 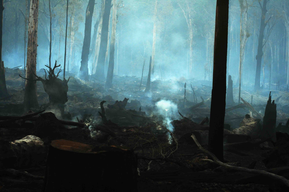 It often takes hundreds of years to replace the carbon lost in logging and burning of forests through trees regrowing. In most cases the carbon is never replaced because forests are logged on short cycles of 30 years, and sometimes even 5 years.